Sinar Harian's article regarding homosexuals and how to spot them, which included frequenting the gym - not to workout but to admire other men - and wearing tight clothes to show off their six-pack (abdominal muscle), has made international news. A slew of foreign publications picked up the report, which has drawn condemnation from various quarters. Among the publications which reproduced the article were The Guardian, Washington Post, the UK's Evening Standard, Huffington Post, news.com.au, NZ Herald and several others. According to Sinar Harian's Feb 9 report, gay men, among others, were fond of growing facial hair and wearing branded clothes. “Effeminate gay men's eyes light up when they see handsome men,” stated the report. 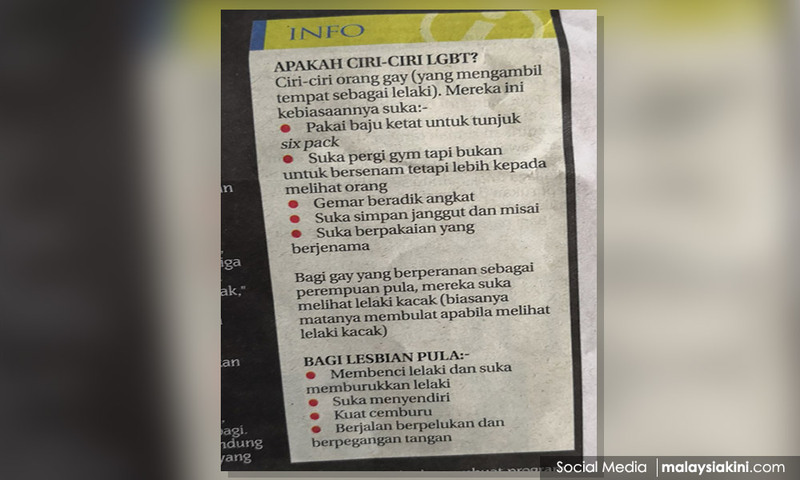 As for lesbians, the Malay daily said these women despised and belittled men, prefered to be alone, tend to hug each other and hold hands when walking. He said this group must be approached with love and patience. In 2012, the Education Ministry's guidelines for parents looking to detect homosexual symptoms in their children also made international news. Among others, the guidelines stated that gay men have muscular bodies and flaunted their physique by wearing V-neck and sleeveless clothes.